NEW YORK, NY (January 26, 2017) — Lincoln Center for the Performing Arts and Theatre Development Fund (TDF) announce that the pop-up TKTS residency at the David Rubenstein Atrium’s Zucker Box Office (located on Broadway between 62nd and 63rd Streets), that originally opened on August 2, 2016, for a limited time, has officially become TDF’s fourth, and only indoor, TKTS Discount Booth in New York City. 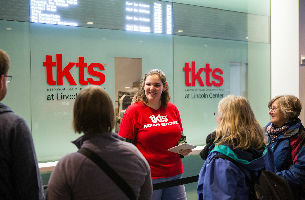 For the past six months, Lincoln Center’s partnership with TDF, the nonprofit service organization for the performing arts that operates the TKTS Discount Booths, has provided New Yorkers and visitors the opportunity to purchase discount tickets and to access the wonderful range of performing arts available in New York. Response has been so positive that TKTS will stay in the David Rubenstein Atrium. 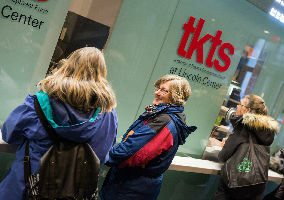 In addition to same-day performance of up to 50% off for Broadway and Off Broadway shows, this TKTS Booth will also feature discounts to Lincoln Center performances. TKTS Lincoln Center is open Tuesday through Saturday from 12:00 to 7:00 pm at the Zucker Box Office. Same-day tickets will be sold for all performances, and matinee tickets will also be sold the day before the performance (in addition to the day of the performance). TKTS discount tickets are generally 50% off and have a per-ticket service charge of $4.50. TKTS opened for business on June 25, 1973, and quickly became a mecca for theatergoers from all over the world. 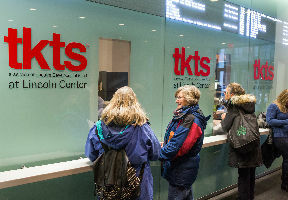 Making theater affordable with same-day discount tickets and providing an urban fellowship of theater lovers on Duffy Square (47th Street and Broadway) has helped turn TKTS into one of New York City’s most photographed landmarks. The current TKTS Booth, housed under red glass steps, opened in 2008 and has garnered over a dozen international design awards. The glowing red staircase above TKTS became the first public space in Times Square, and it quickly became a popular respite for locals and visitors 365 days a year. TKTS also has discount booths at the South Street Seaport at the corner of Front and John Streets and in Downtown Brooklyn in 1 MetroTech Center. 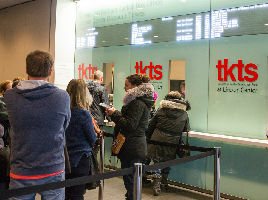 Through all of its locations, TKTS has distributed over 63.3 million tickets to Broadway and Off-Broadway productions since it first opened for business on June 25, 1973. These tickets represent over $2.3 billion in revenue from these same-day sales to thousands of stage productions. The small per-ticket service charge (currently $4.50 per ticket) is used to operate the booths and to help fund TDF’s myriad of education, access, and service programs. The free TKTS app for iOS and Android devices shows in real time what’s available for sale at the TKTS Booths. Theatre Development Fund was created in the conviction that the live theatrical arts afford a unique expression of the human condition that must be sustained and nurtured. It is dedicated to developing diverse audiences for live theater and dance and strengthening the performing arts community in New York City. Since 1968, TDF’s programs have provided over 92 million people with access to performances at affordable prices and have returned over $2.7 billion to thousands of productions. Best known for its TKTS Discount Booths, TDF’s membership, outreach, access (including its newly formed Autism Theatre Initiative), and education programs—as well as its Costume Collection—have introduced thousands of people to the theater and helped make the unique experience of theater available to everyone, including students and people with disabilities. Recent TDF honors include a 2011 Mayor’s Award for Arts and Culture, a 2012 Tony Honor for Excellence for its Open Doors Arts Education Program, a 2012 New York Innovative Theatre Award for its support of the Off-Off-Broadway community, a 2013 Lucille Lortel honor for “Outstanding Body of Work” in support of the Off-Broadway community, a 2016 “Friend of Off-Broadway” honor from The Off-Broadway Alliance, and New York City’s 2016 TITLE II ADA Sapolin Public Service Award. For more information, go to TDF.org. Major support for the David Rubenstein Atrium at Lincoln Center is provided by Alice and David Rubenstein. Generous endowment support is provided by Stavros Niarchos Foundation and Oak Foundation. Lincoln Center has become a leading force in using new media and technology to reach and inspire a wider and global audience. Reaching audiences where they are—physically and digitally—has become a cornerstone of making the performing arts more accessible to New Yorkers and beyond. The reimagination of David Geffen Hall will play an important part in these efforts. For more information, visit LincolnCenter.org. Since its 2009 opening, the David Rubenstein Atrium has welcomed over two million New Yorkers and tourists to Lincoln Center’s campus. A vibrant public visitors’ center, free performance space, and ticketing facility on Broadway between 62nd and 63rd Streets, the Atrium is open daily with an array of services for local residents, the general public, and the thousands of people who visit Lincoln Center and the surrounding community every day. The Donald and Barbara Zucker Box Office remains committed to providing access to discount tickets to world-class performing arts programs taking place at Lincoln Center and beyond. The David Rubenstein Atrium, formerly known as the Harmony Atrium, is one of approximately 503 Privately Owned Public Spaces (POPS) in New York City created under a longstanding program that offers zoning incentives for buildings to provide accessible public spaces. The Harmony Atrium was originally conceived as a lively gathering place for local residents as well as visitors, and the David Rubenstein Atrium proudly fulfills this original vision. The facility is named in honor of the philanthropist, financier, and Vice Chairman of Lincoln Center for the Performing Arts David Rubenstein, in recognition of his $10 million gift to the Bravo Campaign. The Tod Williams Billie Tsien design reflects a respect for the materials used throughout Lincoln Center and provides an open, accessible, and inviting environment. The Atrium is the first LEED certified “green” building on the Lincoln Center campus. The Atrium also features two vertical gardens; a floor-to-ceiling fountain; a media wall with performance information, which also serves as a canvas for video presentations; an art installation by Dutch textile artisan Claudy Jongstra; and 16 “oculi” lighting fixtures that bring natural light and state-of-the-art illumination into the Atrium's interior.